Tucked away off Audley Road is the pretty Acorn, once the stables for the coach house next door. The two bedrooms on the first floor are warm and sunny, one twin and one double, both with wardrobes and desks. Downstairs the comfortable sitting room has a TV and DVD player and excellent dining space. Kitchen and shower room with lavatory are also on the ground floor. There is plenty of off street parking and a courtyard for your pleasure. The historic town of Saffron Walden is the jewell of Essex, bordering Cambridgeshire, Hertfordshire and Suffolk. You are spoilt for choice for walks, activities, history and events. The Tuesday and Saturday markets make the town hum and the endless picturesque views are a reason in themselves to visit us. Saffron Hall the Town’s new award winning concert hall which hosts national and international musicians and orchestras, is a must for music lovers. We offer a choice of bed and breakfast or self catering stays: single nights, weekends or longer stays. A light breakfast pack is supplied for those choosing the self catering option. The accommodation will not suit those with mobility difficulties nor young children. Children over the age of 10 are welcome, sorry no pets. 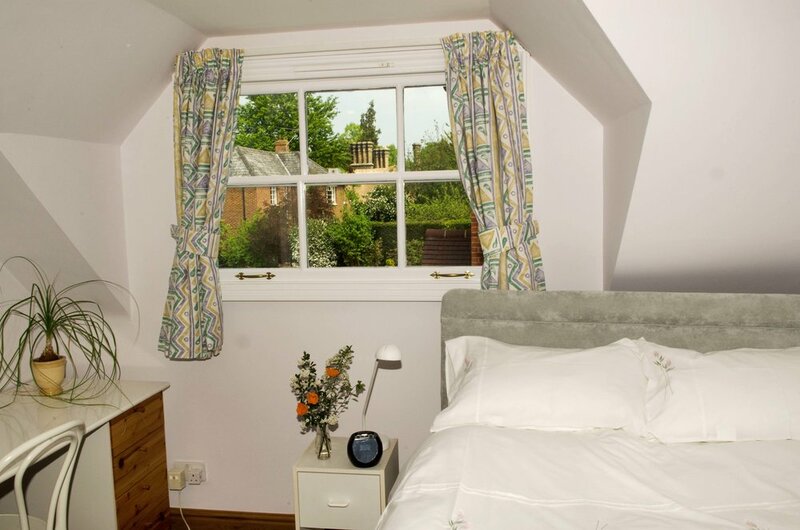 Our light and airy double room looks out across the driveway into the front garden. Our twin room is perfect for friends travelling together. With garden views it is a peaceful place to stay. The downstairs living and kitchen areas are perfect to kick back and relax or use as a work space.